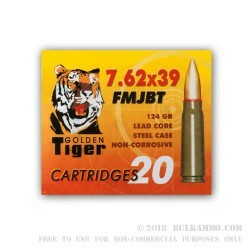 This 7.62x39mm ammo by Golden Tiger is a quality product ideally suited for AK-47's and SKS's. 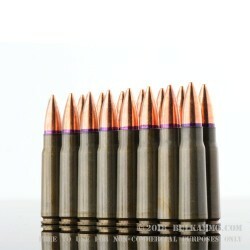 This ammo is steel cased and non-corrosive. To aid in feeding Golden Tiger applies a lacquer coating to the berdan-primed steel case which is then loaded with a 124 grain bi-metal full metal jacket boat tail bullet. 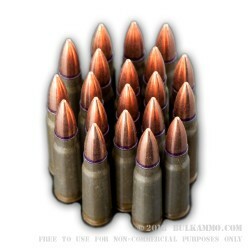 This ammo with its steel case and bi-metal jacket is built for use in rugged AK's and the materials, like most Russian ammo, are chosen to cut costs out of the product with steel being much cheaper than copper. Note that bi-metal jackets contain steel that is then copper washed to mitigate barrel wear but this ammo will attract a magnet so check with your ranges to ensure that they don't have any restrictions against ammo that will attract a magnet. 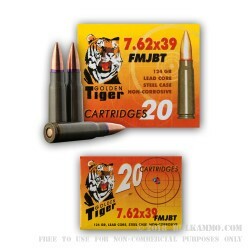 Golden Tiger ammo is manufactured at the Vympel facility in Russia. 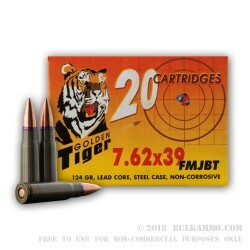 Q: When are you gitting some more 7.62x39 golden tiger bulk? 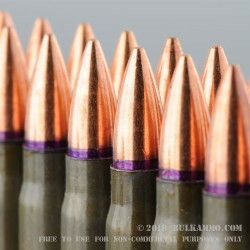 A: Hey John, Steven here from the Bulk Ammo team, thank you for the question and for stopping in on the site. 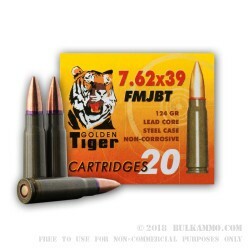 We're working a wider variety of most ammunition back in stock right now, including Golden Tiger 7.62x39. While I would hope it will only be a few weeks, we really can't make any promises or pinpoint dates when specific ammo will be available to us. I'm sorry, I know that's not a precise answer but please know we're doing all we can to get as much ammo in stock as possible right now. We really appreciate your patience and understanding!